Welcome to the place where dragons rule! Bearded Dragons that is. Yes, they have beards, but they don't breathe fire. In fact, they are probably the friendliest reptile you will ever find! This is why I have designed this page so I can show off my family of dragons, and hopefully change the minds of those who think I'm crazy for loving these animals. The Australian Bearded Dragon is a wonderful pet. Not only are they gentle and fun-loving, but fairly easy to care for. 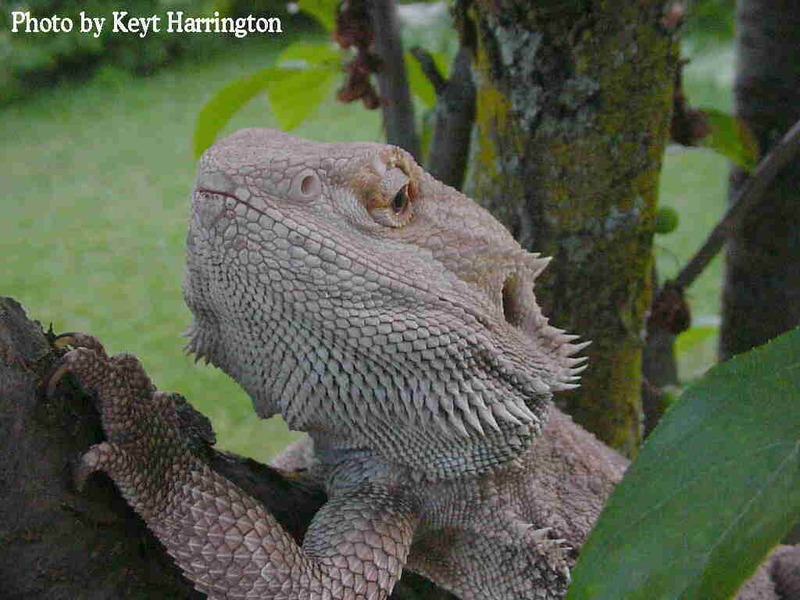 In this site, I will provide many photos of my Beardie family, as well as information to help you learn about them. Thanks for dropping by and taking a look at my photos. Please be sure to sign my guestbook at the end when you're done! Although this is meant to be an informational site, all of the information provided here is given out of my own experience or from other breeders and/or dragon owners that I know and trust. Anything said here is purely a personal statement, and not an absolute. Please be sure to read all of the caresheets at the end of this website and make your own judgements. I also suggest that you find a local bird/reptile vet in your area before purchasing a dragon!